Do you regularly holiday in your own state of WA? Whereabouts is your favourite place? Although most of my longer trips are interstate and overseas my husband and I try to regularly get away for short trips and these are usually in WA. It's hard to say where my favourite spot is, though, as I find it beautiful everywhere. Rottnest Island is nice and peaceful during winter when there are no crowds (and it's easy to get accommodation), down south is always magic and the small beach-side places on the way up to Geraldton are also nice, relaxed spots to spend some time, especially Guilderton with it's nice little riverside caravan park and sheltered waters (on the river) for canoeing. 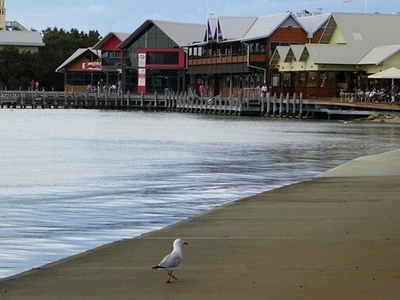 The Mandurah area is awesome while Geraldton is also beautiful with nice beaches, and a good museum and gallery. Closer to Perth, Rockingham has some absolutely lovely beaches while the Wheatbelt is one of WA's hidden gems with quaint little country towns, small historical museums, and lots of nature reserves (many which have spectacular granite outcrops that are great for bushwalking and hundreds of lovely wildflowers after the winter rains). I do not go on holidays any more or rather havent for almost 3 years now. When I had a partner we used to go down south a lot and loved Margaret River and surrounds with its great eating places and shops. Also occasionally stayed at Busselton but Margaret River was always the nicest place for me as I love food, and we used to walk in the bush and swim in the ocean. I love Western Australia. So diverse. Not sure I can say my favorite place because I love both north and south of the river! Yes. I love Margaret River and Witchcliffe. We have holidayed there lots of times as well as Donnybrook. I love getting out of the suburbs and staying in the country. Not what I'd call 'regularly', BUT have been there five times. Most enjoyable was staying at 'El Questro' Homestead, outside of Kununurra. Most picturesque was swimming in Hammersley Gorge, & travelling within the Karajini NP. Saw Mt Tom Price Mine. Swam in Fortescue River, & Python Pool. Most beautiful scene was watching Sunset at Cable Beach, Broome. Got Paspaley Pearl Necklace there for 8th Wedding Anniversary. Left Perth on 'Indian Pacific' for our 5th Wedding Anniversary. Went to Pinnacles NP, Wave Rock, & saw stromatolites.......wow! Next trip there would be to Ningaloo Reef to swim with Whale Sharks. What wonderful W.A. holidays you've had, donjo. Have you been to Ningaloo Reef yet? What Au state do you live in? No, i've been to Fremantle twice on 2 cruises around Australia, & before that, I stayed a week with friends, & before that, called into Perth airport 6 times for an hr, each time, on our way to Harare, Zimbabwe. No, WA isn't my own state, so I've only flown from NSW for a weeks holiday with friends who move there from Harare, Zimbabwe. We used to visit them, in Harare before the blacks started moving in on the white families, & taking over their farms.